With minimal modification you can now fit the Anschutz 5018 trigger to your favorite Remington or Winchester rifle. Adapter is manufactured so that it will drop straight into your rifle. Simply follow the supplied instructions! Briley can fit the trigger for $65. Inlet of the stock is POR. Transfer bars can be ordered seperately as well. Adapter is machined from high-grade aluminum. Transfer bar is machined from suitably hardened tool steel. All new dowel pins and hardware supplied. 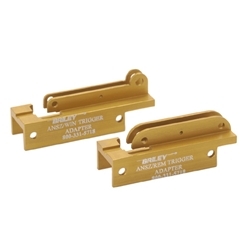 Use of the transfer bar removes all of the striker spring pressure from the connecting link of the Anschutz trigger. This ensures long-term durability without failure or breakage of the connecting link, as happens when triggers are custom fitted directly to the rifle receiver. Stock will need to be inlet for trigger, and the user may need to fit a bolt style safety on Remington models.